Many anglers opt to change out their spinnerbait blades depending on the clarity of the water and conditions they're fishing. Sometimes you don't have time to swap out a blade, or perhaps you don't have any extras. Bending the blade with pliers to add more curve or cup to the blade will give the blade more vibration (thump). This would be appropriate for night fishing or if the water clarity is stained to muddy in color. Be careful to not put not much leverage on the blade or you may put a crease in it. Removing some cup in the blade accomplishes just the opposite. If you're wanting a faster retrive, or perhaps give it less vibration, removing some cup from the blade will do that for you. Whichever direction you go, remember to be gentle with the blades or you may end up having to replace them altogether. Give this hack a try next time you need your spinnerbait to perform a little differently out of the package. 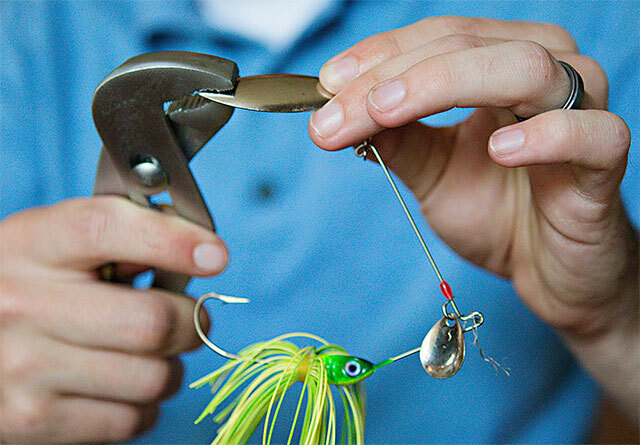 Editor’s Note: This is a fishing hack that you will need to experiment with a bit in order to figure out what works best for the blades and the type/brand of spinnerbaits you use. Remember to make small adjustments when first starting out. Suggest that you have backup blades, just in case.